Only source on the internet has identified this actor as Onoe Shogyoku, an actor we have been unable to find so far anywhere else. Possibly from the rare set: "A Comparison of Various Pictures". The first edition was deluxe with tons of metallic inking. Waseda University identifies another print from this series as being from Hana kurabe nishiki no utsushi-e (華競錦写絵). 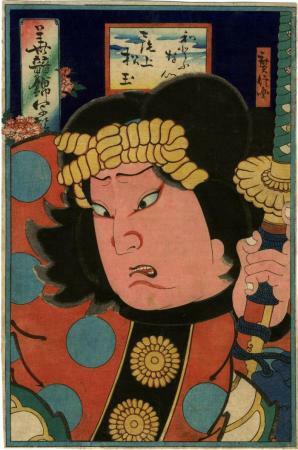 The Japan Arts Council says this dates from the 5/1865.